Run either one or two large format gels simultaneously on these versatile separation systems. The 1614 unit is the ideal unit for separation of complex analytes. Designed to run one or two larger format 16cm wide x 14cm tall gels, the unit provides longer run lengths and increased separation capacity. 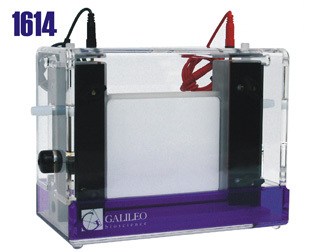 The unique casting base allows both casting and running of the gel without unclamping from the upper buffer chamber, providing for safer and more convenient gel handling. Two 10-well, 1.5mm thick combs. Two 15-well, 1.5mm thick combs.